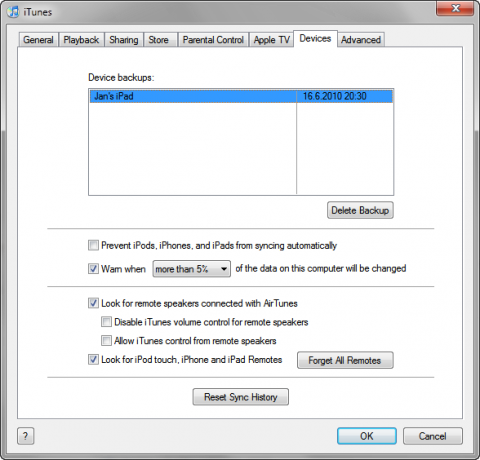 One of the most popular articles here on Backup HowTo is How to backup iPhone. If you have read it already and you have your iPhone backed up, there is a good news for you. Apple iPad is backed up the same way as the iPhone. So anytime you perform iTunes syncing with your computer, all your data from the iPod are copied to the computer, no matter if you are using Windows or Mac OS X.
I bought my iPad a week ago and immediately started to find a way how to backup it. The basic backup is very simple and easy to perform. Connect your iPad to the computer via the USB cable, run the iTunes software (which is also needed for the first time activation of the iPad), and click the Devices item where should be your iPad presented. Then click the Sync button at the bottom and wait for a while until the syncing is done. Everytime you perform syncing iTunes save your iPad data to the computer. 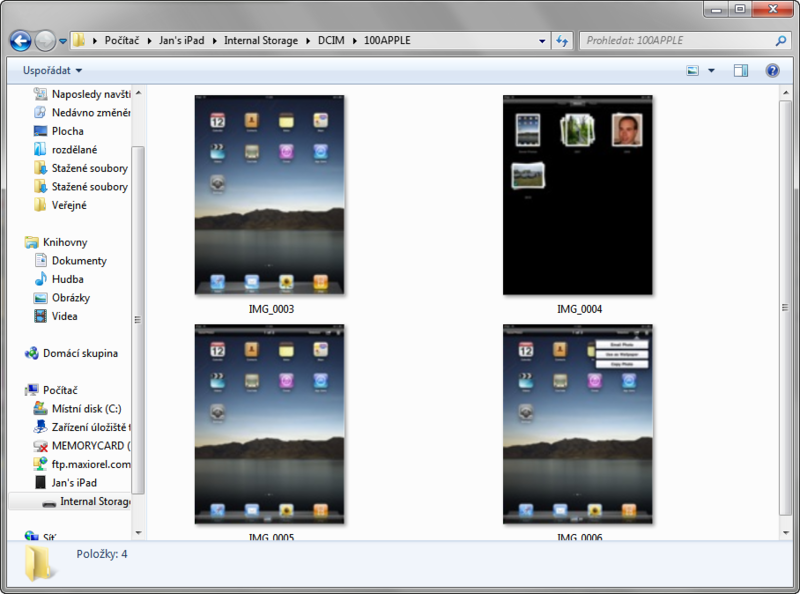 For example, your photos are synced to the c:\Users\Username\Pictures\iPod Photo Cache\ folder in Windows 7. You can also manage your backup in iTunes when you click Edit > Preferences > Devices. Did you bought some paid apps using Apple AppStore and worry about them? You shouldn’t worry about your money. 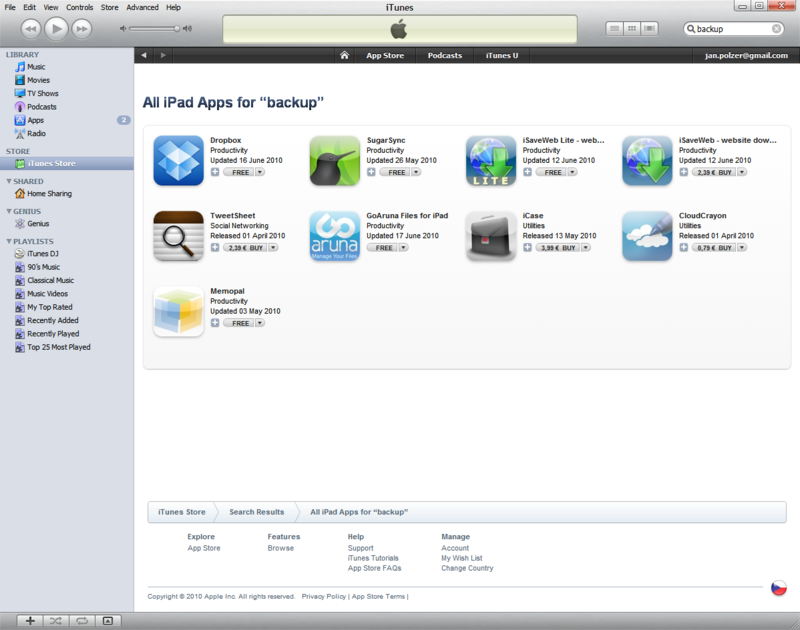 All the apps are automatically backed up when you do iTunes syncing. 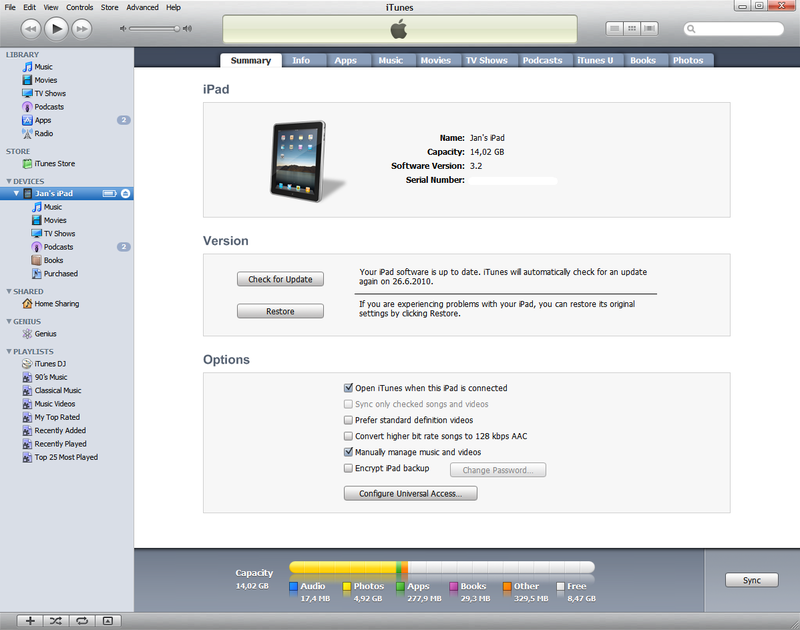 The iTunes also gives you the information about all apps installed in your iPad and about available updates. Tomorrow I installed iTunes 9.2.0.61 to my Windows 7 and I have found one new feature (maybe it was there before already, I’m not sure). There is iPad’s Internal Storage accessible. You can run the Windows Explorer, click the Computer and go to the Yourname’s iPad shortcut. Now you should see iPad’s disk, or better, iPad’s internal storage. Unfortunately, this won’t give you access to the whole iPad’s memory, but if you will take screenshots on the iPad, you can easily move them to the computer. Since the iPad is running the same OS like the iPhone, you can try using other backup software to get the data from the iPad. The CopyTrans Manager mentioned on Backup HowTo a while ago, should do this job. 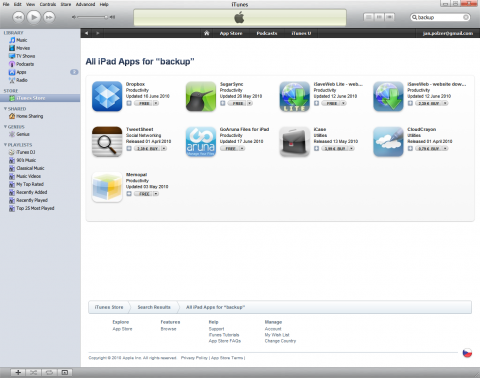 When you will browse through the AppStore, you should find some new specialized backup apps written directly for the iPad. If you are familiar with the Dropbox backup and sharing service, you can download its client for the iPad for free. The same is available for the SugarSync. 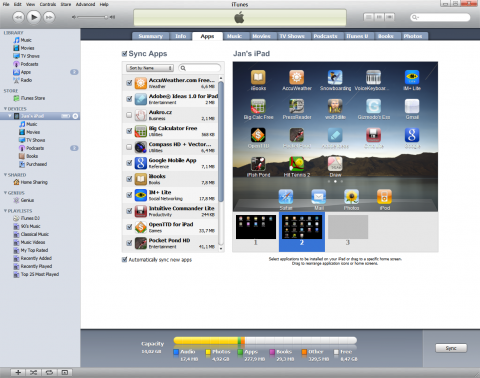 There is also a few other syncing apps, just try them. Apple iPad is very nice and useful computer like gadget. I like its speed and simplicity. You have to know and take it as it is not the laptop. And if you will understand this position, you will not lack the USB ports for example.